A blended family of seven was looking for a cohesive setting for the family to gather. BaumHouse design worked with the homeowners to open up the space and make it more family friendly. The homeowner disliked the existing island, stand-alone table and cluttered desk area. 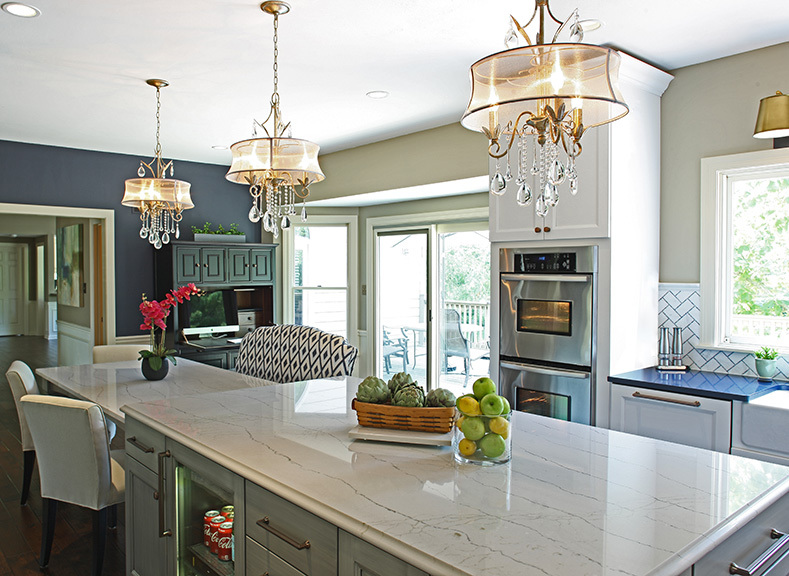 The designer opened the space between the kitchen and dining room and also removed a large soffit over the island. A narrow walk-in pantry was removed. With such a large family, a beverage refrigerator was included in the island on the opposite side from the working aisle of the kitchen for serving ease. The perimeter of the kitchen is faced in painted white custom cabinetry, while the island has a contrasting gray glaze. The refrigerator and dishwasher are clad in matching cabinetry panels. Pullouts for trash, spices and utensils are next to the sink and cooktop for ease of use. The island and perimeter counters also contrast with a deep rich blue around the perimeter and simpler white on the island. The designer chose the backsplash tiles to marry the countertops to the splash area. For the table area, the wife loved the idea of a banquette but the husband did not. A compromise was made with the custom bench seat. The table is attached to the island and dropped to a height suitable for family meals and entertaining. 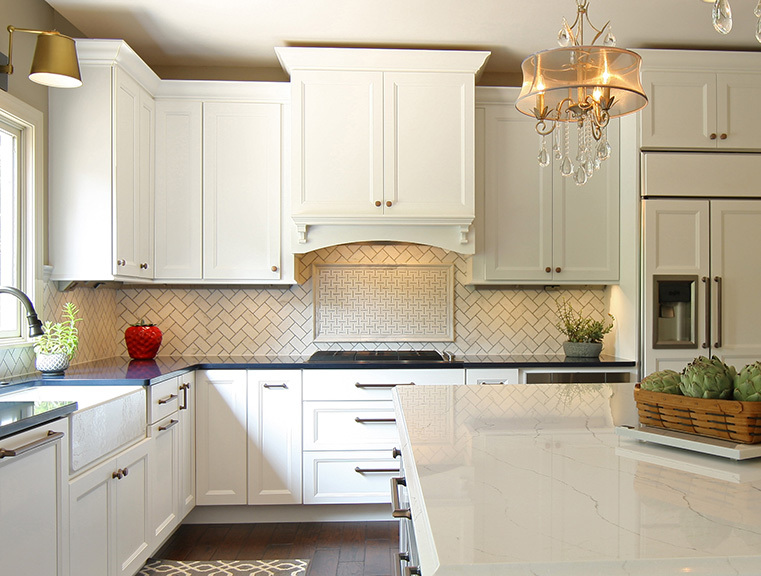 The colors in this clean, yet traditional kitchen are so fresh. The posts the designer chose for the island are fabulous and give a different twist to the finish details.